Ibiza passenger and car ferry ticket prices, timetables, ticket reservations and information for ferries sailing from Ibiza to Barcellona, Denia, Formentera, Palma Mallorca, Palma and Valencia. Compare all available Ibiza ferry ticket prices in real time and book the cheapest available Ibiza car and passenger ferry tickets sailing to and from Ibiza, Barcellona, Denia, Formentera, Palma Mallorca, Palma and Valencia with Acciona Ferries or Balearia Ferry Line ferries online with instant confirmation. Book Ibiza Ferry Tickets with Acciona Ferries or Balearia Ferry Line for ferries sailing from Ibiza to Barcellona, Denia, Formentera, Palma Mallorca, Palma and Valencia online in advance to enjoy the cheapest available ferry ticket price. The price you see is the price you pay. There are no hidden extras or surprises such as added fuel surcharges or booking fees and we do not charge you anything extra for paying with a Visa Electron card. The price we quote you for your selected Ibiza passenger or car ferry ticket, onboard accommodation and vehicle type is all you will pay, and that's a promise. To obtain a Ibiza ferry ticket price and book your ferry ticket securely online please use the real time ferry booking form on the left. You are also able to add a hotel at your destination, or anywhere else, to your ferry ticket when completing your ferry ticket reservation. The Mediterranean island of Ibiza (Eivissa to the locals) is situated half way between the coast of mainland Spain and the larger island of Mallorca, approximately 100 kilometres from each. Ibiza and its smaller neighbour, Formentera, are referred to as the Pitiuses, and the Pitiuses, together with Mallorca and Menorca, form a group of islands collectively known as the Balearics. Ibiza belongs to Spain, although one would not think so from the proliferation of mainly British and German tourists who descend upon the island during the summer months. Indeed, the Ibicencos tend to think of Ibiza as a country in its own right; the Spanish mainland is even jokingly referred to as "the peninsula". The main language of Ibiza is Catalan, a form of Spanish that differs slightly from the better known Castilian. Road signs and menus use both forms of Spanish, but there is a definite preference for the local Catalan - hence 'Eivissa' rather than ' Ibiza ', or 'bon dia' rather than 'buenas dias'. It is often assumed that Ibiza is nothing if not predictable: its popular image is of an island filled with clubs and crowded beaches, lacking in culture or tranquillity. This image is very far from the truth, and it only takes one visit to the White Isle to realise that it has so much more to offer than overpriced drinks and loose-moralled clubbers. The towns themselves - of which the main ones are Ibiza Town (Eivissa), San Antonio and Santa Eularia - are where the majority of the nightclubs and hotels are based. Ibiza Town in particular, however, is a major key to much of the island's long and fascinating history. Dalt Vila - Ibiza Old Town - was built as a defensive fortification between the eighth and fourteenth centuries, although the site of the town has been strategically vital to the invaders who have conquered Ibiza over the past few millennia. Nowadays, Dalt Vila is one of the island's most beautiful and cultural artefacts, made all the more impressive by the fact that it is inhabited mainly by Spanish families. The cobbled streets and winding lanes are a far cry indeed from the packed streets of San Antonio's West End. When it comes to beaches, Ibiza excels. Whether you're looking for a party beach amongst beautiful people - Salines and Platja d'en Bossa - or a family beach with great sand - Cala Llonga and Cala Tarida - or a secluded spot - Cala Conta and the secret beach known as Atlantis - Ibiza has it all on offer. Most of the beaches are sandy, and many are flanked by stunning cliffs on either side. On the north coast in particular, there are some challenging coastal walks to be done. Of course the island's best-known feature is its nightlife, and, though expensive, it certainly doesn't disappoint. From aircraft-hangar-style clubs such as Privilege to the more intimate and trendy (Pacha) and the downright fabulous (Space), there's something for everyone. Clubs aside, there are numerous cafés, bars and restaurants all over the island, and a night out need not be extravagant or expensive. As well as being famed for its hedonistic nightlife, Ibiza has a rich spiritual heritage from its Hippie Ibiza visitors in the 1950s and 1960s. As a result, Ibiza is notorious for its trance parties and chillout sunsets, its laid-back attitude and hippie markets - the most popular being at Es Cana. Ibiza's dubious reputation is one propagated by people who have never been there; it takes only one visit to realise that the island is without doubt one of the most varied, exciting and unforgettable experiences of the Mediterranean. As a small Mediterranean island, ferries and boats are integral to Ibiza's internal and international transport routes. Whether arriving on the island or seeking a novel way to get from one beach to another, ferries can be the most pleasant - if not the most efficient - way to travel. It is possible to reach Ibiza by ferry from the larger port towns of mainland Spain's east coast, although it is worth remembering that ferry services tend to be more frequent during the summer months. The closest mainland port town is Denia, which offers two crossings per day by hydrofoil (two and a quarter hours to Ibiza Town) and two crossings per day by ferry (four and a half hours to San Antonio). From Barcelona there are on average four ferry crossings per week, lasting around nine hours, and from Valencia there is one hydrofoil crossing every day, lasting three and a quarter hours. From Alicante there is a daily hydrofoil service to San Antonio, lasting approximately three hours. 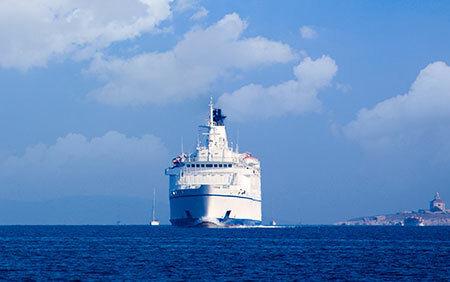 Various companies offer regular ferry and hydrofoil crossings between Mallorca (Palma) and Ibiza. The hydrofoil crossing lasts around two and a half hours, while the ferry takes a little over five hours. This speedy service runs throughout the year, although hours are extended during the high season (from early in the morning until 10pm). There are almost 30 crossings every day in the summer, and around one every hour between 7am and 7pm out of season. Ferries arrive at the Formentera port of La Savina, where it is possible to hire cars and bikes, and the return crossing per person costs about the same as a reasonable restaurant meal. Boats shuttle regularly between the three large port towns of Ibiza - Ibiza Town, San Antonio and Santa Eularia - and the surrounding beaches. These short trips are well worth trying out, and generally cost no more than the price of a beer. The departure area at Ibiza's port is on Passeig Maritim, and in San Antonio it is at Passeig de ses Fonts. Between midnight and 3am, there is even a boat service between Ibiza Town's Passeig Maritim and the nightclub El Divino, located just across the harbour. With all ferry journeys to and around Ibiza and Formentera, with the exception of the El Divino boat service, it is advisable to book in advance where possible. Remember to take sun cream with you for all daytime boat trips, as there is often no escape from the sun on board. Best Price Guarantee - We always offer you our lowest available Acciona Ferries or Balearia Ferry Line passenger and car ferries ticket price to and from Ibiza. There are no hidden extras or surprises such as added fuel surcharges or booking fees and we also we do not charge you anything extra for paying with a Visa Electron card. The price we quote for your selected Ibiza ferry ticket, onboard accommodation and vehicle type is all you will pay, and that's a promise! In the unlikely event you find the same all inclusive Ibiza ferry ticket cheaper in the brochure of any other tour operator we promise that we will do our best to beat that price or offer you the choice of requesting a refund. To book Ibiza car and passenger ferry tickets please click here. At ferryto.co.uk you are able to obtain live Ibiza ferry ticket prices, check availability and book car and passenger ferry tickets to and from Ibiza at our lowest available ticket price. Ferryto.co.uk is part of the world's largest online ferry ticket distribution network providing the ability to book over 80 major European ferry operators including to Ibiza and to over 1,200 other ferry routes throughout the UK, France, Spain, Ireland, Holland, Eastern Europe, the Mediterranean, the Baltic and North Africa.